Hey everyone, happy June! According to my calendar, summer starts in about 20 days. According to the actual weather… been here for a while! I’ve been insanely busy these past few weeks, and have some exciting news to announce (which I end up giving away in this post, but you’ll need to read it to find it!) about new features coming this month! But I couldn’t leave everyone without your list of new apps! Google Photos by Google, Inc. (iOS, Android), free. 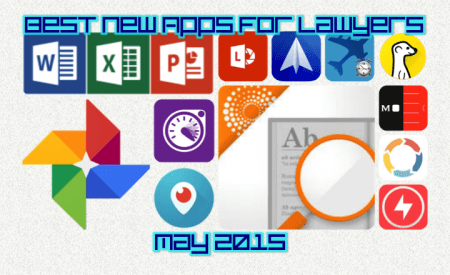 Ok, so this one might not necessarily have too many lawyer-centric photos, but Google Photos is probably one of the coolest apps released this month (and it’s my blog, so I’ll include it if I want to!). Sorry, just a little tired. Even your old photos, taken back in the stone age (prior to, say, 2001) become searchable, too. That old photo by the Eiffel Tower – Google has that location on file, so it comes up in your search for “Paris.” Pretty cool, huh? Not impressed? Ok. It can also recognize the breed of your dog. A while back, I told you about a unique new trivia game called QuizUp (along with its subsequent release on Android). Well, the makers of QuizUp believed that it was time for an update, and this one is massive. Now, your favorite time-waster is a social time-waster. Meet and connect with new people online based on common trivia interest. They’ve also added new information to user profiles, including game statistics, most-played topics, and personal updates. Perfect for the non-competitive trivia participants we all know lawyers to be. Black’s Law Dictionary by Thompson Reuters, $54.99. The 10th Edition of Black’s Law Dictionary, the first and biggest name in legal dictionaries, has come to iOS. Sporting definitions of more than 50,000 terms, including more than 16,000 new definitions (and 7,500 more than the 9th edition – makes me wonder what terms got “retired), it calls itself the most comprehensive law dictionary ever published. It’s got the street cred to support that argument! Helpful tools like the pronunciation guide (with audio of more than 7,000 terms) and “Did You Mean” search functionality brings new multimedia tools to this trusty, reliable reference. Links to sub-entries and cross-references allows you to easily navigate through any complex definition, and links to Westlaw will help about 40% of legal practitioners (the other 60? – 40% use Lexis, and the other 20% pretend to get by on Google Scholar and Fastcase). TimePage by Moleskine Srl , $4.99. So if you’re a lawyer, you’ve probably seen one of your colleagues – you know, the “white shoe” types who have $1,000 pens – walking around with a Moleskine notebook at some point. (Don’t worry, I’m only kidding, not judging any of you!) Well, they’ve decided to get into the app game, and the results are very pretty, as you’d expect. TimePage puts your calendar into a beautiful timeline, allowing you to view your entire day, week, or month in a linear, easy to read format. It syncs across Microsoft Exchange, Google and iCloud, and even includes an Apple Watch app. The coolest features, in my opinion, are the weather app – your calendar will tell you the weather of your destination for each appointment – and the “this day in history” feature. Yep, have the temerity to leave a day blank, and you’ll find out something interesting that happened on, you guessed it, that day… in history! Simple Form by Corvus Technologies, Inc., $12.99. Have you been looking for a better way to collect information from your (potential) clients when they come to your office? Do you have them fill out a form? Then you really need to invest in this app! Using any of 10 available entry fields, including name, address, contact information, occupation, and more, turn any device into a paperless form collection system. You can even create your own fields, designed for text, email, date, time, or numbers. Several templates will give you some ideas, and you can add your law firm’s logo right to the form. Monitor response collection over Wifi or bluetooth, or export via email, AirDrop, or file transfer in CSV file (Excel) for easy access. You can even fill in parts of the form by scanning QR codes or barcode data (maybe drivers licenses?). An excellent tool to keep pushing your office towards paperless! Spark Email by Readdle, free. Ok, the email app market has gotten crowded, so in order to include one here, it should have to meet a pretty high bar. Spark does. If you’re looking for a simple, no-frills email app, stop reading. If, on the other hand, you’re one of those people who needs a more complicated email app, and includes the phrase “inbox zero” in your vocabulary, take a look. Spark detects automatically whether an email is personal, a notification, or a newsletter and groups them together for faster reading. Quick processing of emails using “swipe” gestures allows you to get through a lot of emails quickly, pin emails which relate to things you need to do today, and snooze emails that can wait until tomorrow. The Quick Reply feature allows you to send “Thank you” or smiley face responses with just a tap. Periscope by Twitter, Inc., free. Finally making it’s debut on Android OS, Twitter’s live broadcasting app Periscope allows you to create or view live broadcasts on your device. Sound basic? Well, it apparently got over 1 million users in 10 days. Broadcast to your followers worldwide, who are immediately notified that you are live. They can join and comment on your broadcast in real time, which could be a remarkable new element to Twitter Chats, if you use them (you should). Allow your followers to replay your broadcast for up to 24 hours and, most importantly to attorneys, restrict access to any broadcast to as few people as you’d like. Microsoft Office Lens by Microsoft Corp., free. Sorry Android users, but this is just a month of “iOS had it first!” Then again, there’s a reason they brought these apps to Android – they’re that good. Or the publisher has that much money. In this case, it’s probably a bit of both. Office Lens allows you to take a photo of handwritten notes or other documents, which the app immediately converts into an editable format. And not just any editable format, but a Microsoft Word document. With modes to capture images, business cards, documents, and even whiteboard notes, you’ll always be able to turn your notes into a workable digital format. Ok, so you might say this is cheating a little bit. After all, didn’t I talk about this one last month? Well, thank you for being a loyal reader! And yes I did, but I’ve been really freaking busy putting the new Cyber Advocate podcast together (look for launch later this mont! ), so… sorry. Anyway, this is the full-fledged, non-beta, no-invite-required announcement that you can now get Meerkat, the app that set SXSW a little more on fire than Austin usually already is. Live streaming video, connection directly with all of your Facebook friends, and a cute little rodent on the icon. What more could you ask for? Ever arrived at the airport, only to find out your flight was cancelled in the time it took you to get there from your house? Of course you have. Well, now (for Windows Phone users – let’s be honest, iOS and Android have had these apps for years) you don’t have to worry about that! FlySmarter is your up-to-the-minute way to check on your flight’s status. Add a flight, and the terminal map of the departure and arrival terminal are automatically downloaded to your phone. That way, while you’re sitting in your departure terminal due to a delay, you can already be planning your escape route to baggage claim for when you finally arrive at your destination! Hyperlapse Mobile by Microsoft Corp., free. You know those videos that are really long, slow and boring? Like most of your vacation videos? Or, certain parts of that video you’re going to play for a jury? It certainly would be nice to be able to shorten that part, without having to edit the video or fast forward (kind of makes you look like you’re hiding something, ya know)? We’ve been waiting for non-iOS versions of Instagram’s Hyperlapse, but what do you know, Microsoft just beat Facebook to something! By generating it’s own 3D world from your footage, Microsoft’s Hyperlapse runs a steadycam-like path through, to make sure your footage is smooth and clean.